There was no aloha for aloha shirts Sunday as world leaders, for the second year in a row, discarded the tradition of appearing in locale-specific attire for their "family photo" to wrap up the Asia-Pacific Economic Cooperation annual summit. Star-Advertiser. President Barack Obama on Sunday tied the hopes of a faster American economic recovery to the booming Pacific Rim region, saying "we're not going to be able to put our folks back to work" unless the Asia-Pacific region is successful as an engine for the world. Associated Press. 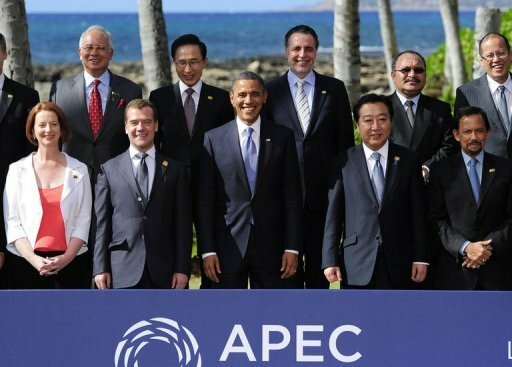 President Barack Obama on Sunday declared the Asia-Pacific Economic Cooperation summit a success that will strengthen the U.S. economy, and he expressed gratitude to his hometown for hosting representatives from the 21 APEC nations. Star-Advertiser. President Obama wrapped up the Asia-Pacific Economic Cooperation summit here on a personal note yesterday, thanking the people of Honolulu for their "extraordinary hospitality" and telling his visiting guests that Hawaii “made me who I am.” Civil Beat. President Barack Obama capped the end of the Asia-Pacific Economic Leaders' Meeting Sunday night with pretty much the same message he has been pushing all weekend — that the Asia-Pacific is the fastest-growing economic region in the world and one that the United States recognizes as a catalyst for its own future economic successes. Pacific Business News. Asian-Pacific leaders have agreed on a range of measures to boost economic growth, including simplifying trade rules and cutting tariffs on green energy goods. Hawaii Reporter. To give you an idea of just how unimportant the APEC summit was to the White House press corps, consider the fact that, of the 10 or so questions asked of President Barack Obama at his concluding press conference, just three or four were about APEC. Civil Beat. At this week’s Asia-Pacific Economic Cooperation (APEC) forum, Secretary of State Hillary Clinton reiterated U.S. intentions in leading a united effort to establish free and fair trade throughout the Pacific. Hawaii Independent. While trade was the main focus of last week's APEC meetings, a number of other topics were also discussed. One was the role of women in regional economic growth---and what can be done to boost that role. Hawaii Public Radio. More than one thousand people, many of them local Filipino-Americans, attended a dinner honoring Philippine President Benigno Aquino III. It was the only public appearance for Aquino, who was in Hawaii to attend the Asia-Pacific Economic Cooperation summit. Hawaii News Now. Makana Slips In Protest Song, Performing Before APEC Leaders. KITV4. The big question many people have been asking - was it all worth it? KHON2. An independent review panel is leaning toward recommending that the city abolish property tax exemptions for roughly 150,000 Oahu homeowners, including the blind, elderly and disabled, as part of a major but controversial effort to bring more fairness, efficiency and accountability to the tax system while generating additional revenue for city services. Star-Advertiser. The stars of CBS' "Hawaii Five-0" will be lending a hand off-screen to military school kids at Pearl Harbor. Associated Press. Hawaii County Corporation Counsel Lincoln Ashida on Sunday announced his campaign for prosecuting attorney. West Hawaii Today. When the federal government sought a training area to transition volunteers in the newly forged Peace Corps to posts in Southeast Asia, the Big Island was a natural choice. West Hawaii Today. The county should require property owners to dedicate their land to agriculture before awarding them significant tax benefits, according to a group of Maui County Council members formed to investigate the system. Maui News. Kihei teen Matt Matasci got a once-in-a-lifetime experience Saturday when he heard speeches by world leaders including President Barack Obama and Chinese President Hu Jintao at the Asia-Pacific Economic Cooperation summit in Honolulu. Maui News. Hawaiian guitarist Makana says he put his fears aside and listened to his heart when he chose to repeatedly sing his protest song, “We Are the Many,” to world leaders gathered for an APEC dinner Saturday. Garden Island. The National Prescription Drug Take Back Day drive on Oct. 29 at the Kaua‘i Police Department headquarters resulted in the recovery of 120 pounds of various unused medications, county officials said. Garden Island.